Is there a difference between coriander and cilantro? Do they come from the same plant? Can you use either one? I found cilantro listed in the dictionary as a flat leaf parsley, but not coriander. Please help, my wife and I are locking horns about this. You can unlock horns because coriander and cilantro are the same plant. For some reason we Americans use the Spanish name "cilantro" when referring to the leaves of the coriander plant, while the seeds of the same plant are called "coriander" seeds. Go figure. 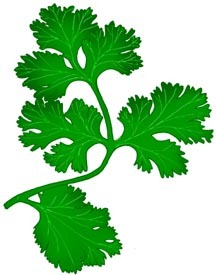 Most of the rest of the English-speaking world uses the term "coriander" when referring to both the leaves and the seeds.